Keep your University Email Account after you Graduate! Thanks to iSolutions, students graduating after Summer 2013 can benefit from the creation of new email accounts that they can freely use for the rest of their lives. Normally, students’ University email accounts would be rendered inaccessible three months after graduation and they would have been able to use the Email For Life Forwarding Service, which provides the user with a forwarding address (rather than an email account) which directed all emails sent to their old University accounts to any account they nominate. Now, however, alumni can benefit from a new permanent University account, enabling them to stay in touch with old friends and lecturers and maintain a link with the alma mater. The new email addresses will be just as easy to remember as they will merely add the word ‘alumni’ – for example, ab2g13@southampton.ac.uk will become ab2g13@southamptonalumni.ac.uk. The new account will be created when its predecessor expires, ensuring a seamless transition to the new email addresses, and the password will even remain the same as it was when you last used your student email account. 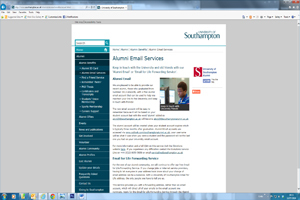 Email accounts can be accessed via www.outlook.com/southamptonalumni.ac.uk, and if you have any queries you can visit the iSolutions website by clicking here. For the rest of the alumni community the Email for Life Forwarding Service will continue to be offered as a way of directing mail to a nominated email account. This way, instead of manually sending out change of email address emails to all of your contacts, which can be time-consuming, the University can handle emails sent to your old account by automatically forwarding them to an account of your choice. You can apply for an Email for Life by filling out this form. If you have any difficulties with, or queries about any of the above services, contact iSolutions on +44 (0)23 8059 5656 or email serviceline@southampton.ac.uk.